The internet is a funny place. We’re happy to share what we ate for dinner or our most innate thoughts for free with all those “friends” on Facebook. But, when it comes to sharing vital information to create a business connection, sometimes scepticism inspires a shield of anonymity. And we hear just the same thing from YouTubers. 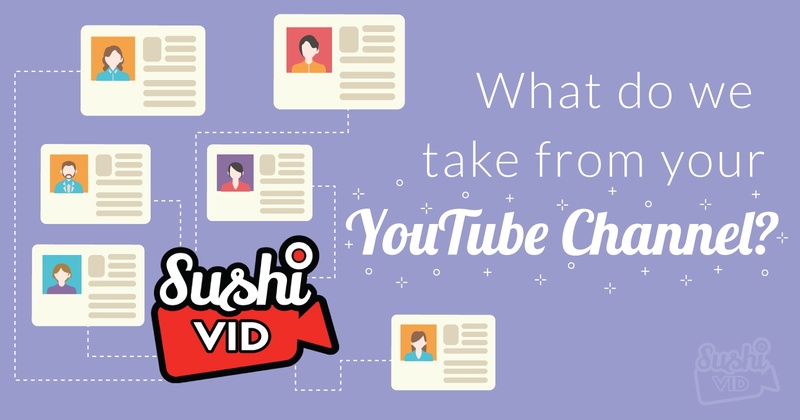 Sure, you’ll grace the screen with your wonderful faces, but the thought of providing personal information to a brand-YouTuber market place to secure a business connection has some of you quivering in your boots. No judgment here – the thought of connecting on LinkedIn provoked such social anxiety in me I was quickly reaching for the Valium. Of course, as Franklin D Roosevelt once said, “the only thing we have to fear is fear itself.”Indeed, there is nothing frightening about SushiVid. We’re all about swimming together as a shoal, to create a vibrant YouTuber community. And as you are our most vital ingredient, we don’t share any of your personal information. As you can see, the brands see a directory of YouTubers sorted by category, your image on YouTube (or you can upload your own), number of subscribers, your average views which we calculate by taking doing some simple math (the sum of all your views divided by the number of videos you have posted) and a short description of yourself which we pull from your about page on YouTube. We have provided links to your YouTube video viewership data and reviews if you have done any work with brands on our platform. 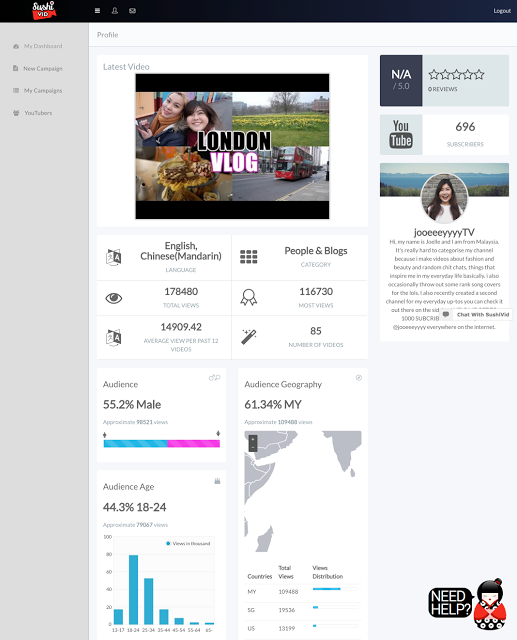 Along the right side of the screen we’ve also broken down your viewer stats into country, age group and gender so that brands can be assured of reaching their targeted demographic. 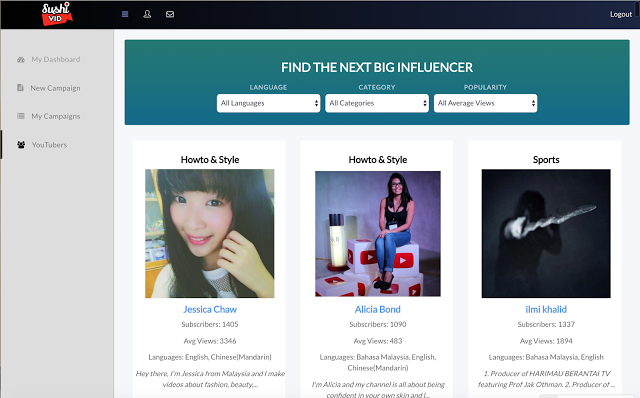 In the future we’ll also be calculating engagement and subscriber growth rates to show brands just how attractive using your services for YouTube marketing can be. And, if you are one of those blessedly bilingual or multilingual people (not jealous at all) then we’ll let brands know too. Essentially, we have collated information that is publicly available about your channel in a presentable manner (Screenshots are so 1996 guys! ); this is the kind of information that could be found on socialblade.com or vidiq.com, just with a more refined analysis (even if we do say so ourselves). Information of this sort will give the brand manager pitching your idea to management the edge, as it is far more meaningful in proving conversion. So, put the Valium down! Just as LinkedIn has been a value add for me, you can be confident that joining up to SushiVid doesn’t mean signing your life, or your credit card, away. Check out our blog on how to charge brands.